We present a new game that has been based on two recent hits of horror games. We are talking about the merger between Five Nights at Freddy' s and Bendy and the Ink Machine. They are two games that have things in common and this Scratch version has united them to create a fantastic adventure. In FNAF he tells us the story of a security guard who will work for a well-known pizzeria and in which it is said that the dolls in it come alive at night to scare the guard. You have to survive a week to win. In Bendy, they tell us the story of a man who returned to his hometown receives a note from his former boss, for whom he worked in an animation studio called Joey Drew Studios. Upon arrival, you will see how a failure of the machine has given life to certain characters, including Bendy. In this merger, we will have to help the security guard of the animation studio to survive seven nights in his job, without receiving a big scare from the Bendy ink doll. You should be in your work room and watch the cameras to know at all times where the evil Bendy is. Scares and fun are assured in Five Night at Bendy. 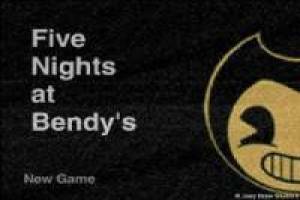 Enjoy the game Five Night at Bendy, it's free, it's one of our Bendy and the ink machine games we've selected.